NEWARK, New Jersey (CNN) -- Her powerful voice resonates through the music hall, delivering an unlikely message of hope. The musical group Liyana has completed its U.S. tour but is wary of returning to Zimbabwe. The Afro-fusion melody comes from an unlikely source -- the small, wheelchair-ridden body of Prudence Mabhena, a woman from Zimbabwe who has overcome her physical disabilities and the hurdles of daily life in her home country. "Some people don't even get you and take you as a person," Mabhena said. "And with us singing right now, we're not giving up -- we're pushing up." Mabhena was born with arthrogryphosis, a muscle and joint disorder, and had to have parts of her arms and legs amputated as a result. She said her mother was told to kill her rather than have her face life as a physically disabled woman in Zimbabwe. Zimbabwe was once a center for disability rights after it gained independence in 1980, according to recent report on Public Radio International. It was one of the first countries to recognize the rights of the disabled, who are sometimes shunned by communities in rural Africa who fear they are touched by witchcraft. But the gains for the disabled in Zimbabwe have been erased by the country's current crisis, according to Dr. Raymond Lang of the London-based Cheshire Center for Conflict Recovery who spoke to PRI's Lonny Shavelson. Mabhena said the group is apprehensive about returning to Zimbabwe after its U.S. tour, which wrapped up this month. But none of the members of Liyana dwells on the despair. "'Never give up' -- it's one of our biggest and strongest mottos," said singer Tapiwa Nyenger, explaining one of the band's song titles. "We have the capability to go on stage and at the end of the day make people smile. It's a good feeling." 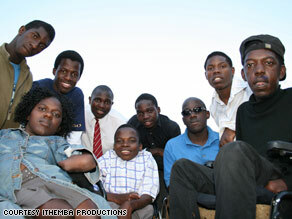 All eight band members, who are between the ages of 17 and 23, met at the King George VI school for disabled children in Bulawayo, Zimbabwe. The band describes their music as a fusion between "myriad geographic, cultural, and musical genres including gospel, reggae, and traditional Zimbabwean Shona music." Liyana means "rain" -- a Shona term for good luck. "Music makes you think of something positive," Nyenger said. "For me, music is rehabilitation." Mabhena has said her voice is a gift from god. They had long dreamed of performing in the United States, and their multi-city tour included more than 20 performances in California and the New York metro area, including the New Jersey Performing Arts Center in Newark. "We have been received in an overwhelming, heart-filling way," Nyenger said. "Everywhere we go, every place we go, we [see] new things, we meet new people, we learn new stuff." The band's U.S. tour coincided with President Barack Obama's inauguration, which has also been a source of inspiration for a new song, "Obama." "When we heard Obama was going to be the American president, the first black American president, we were so excited," Mabhena said. "Through that joy that we had, there came a song." Liyana is also the subject of a new documentary, iThemba -- My Hope -- which is scheduled to be released worldwide later this year. The band's singers perform in seven languages -- Shona, Ndebele, English, Dutch, German, Hebrew, and Spanish -- allowing them to reach a wider audience. "We want to leave a message to everyone in the world that no matter what circumstance you are in, you can make it," singer Marvelous Meulo said.